Minnesota welfare rights activists protest at Governor’s Mansion | Fight Back! Protesters outside the Minnesota Governor's Mansion. St. Paul, MN - Members of the Welfare Rights Committee (WRC) and their supporters “occupied” the Minnesota Governor’s Mansion on Jan. 8. 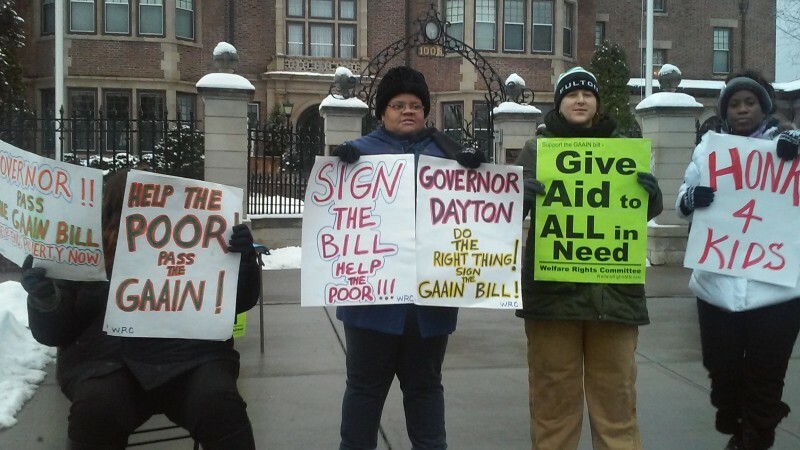 The protest demanded Democratic Governor Dayton give aid to all people in need. Last Minnesota legislative session, WRC wrote a proposal, “Give Aid to All In Need,” that was introduced as the GAAIN bill, (SF1426 & HF1533) by Sen. Chris Eaton and Rep. Susan Allen. 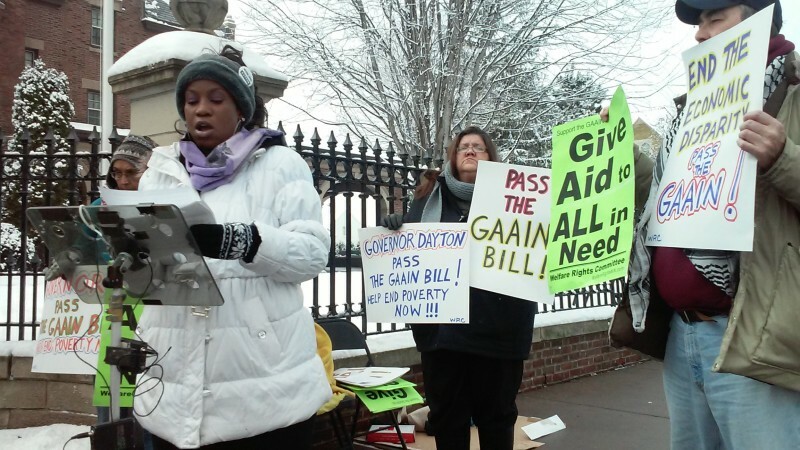 The GAAIN bill instructs the state to give cash grants to people who have no income and are still looking for work. When the 2016 session starts in March, the welfare rights activists will again be marching to the State Capitol to advance the bill until it becomes law. Later in the day as the governor, along with the legislative leadership, was meeting inside the mansion, WRC members ran into the governor’s press secretary. The activists conveyed their concerns about the governor ignoring poor peoples’ issues by refusing to meet with them directly. They handed the press secretary the WRC statement and demanded the governor be given the information. Later that day, the group received confirmation that it was in the governor’s hands. As the workday ended, the House Speaker Kurt Daudt, a Republican, spoke at a press conference outside the mansion. The WRC confronted him before he left about how he and his party also refuse to help the poor in Minnesota. For organizations and individuals that want to endorse the GAAIN campaign email the Welfare Rights Committee: [email protected]; or visit their website: http://welfarerightsmn.com.